It is often stated that one of the best compliments you can pay a book is to say that you could not put it down. I would alter that idea slightly. 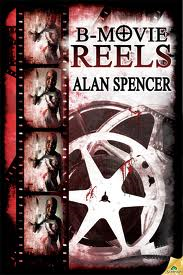 B Movie Reels by Alan Spencer proves that sometimes a great book is one that has so much going on it that you have to put it down every once in a while to allow your brain to process all of the visuals that are being laid out for you on the page. The key is that you are eager to pick it right back up again the second your brain permits you to go on. This may seem like the set-up for a b movie itself, but Alan Spencer takes the time to set up a story that will leaving you hungering for more story like the undead hunger for brains. We are immediately drawn into the story with the tale of a magic show gone horribly wrong and the magicians desperate, yet at the time unexplained, desire to destroy everything involved in the show. From the very beginning, the story is original. With the mystery laid out before us, we are introduced to Any Ryerson, our lead protagonist, and it doesn't take long for the action and horror to start. Between the terrors that swarm throughout the pages of the story, Spencer takes time to let us get to know our characters enough to care about them somewhat. While I would have liked a little more back story on the sheriff, Andy and his Uncle Ned are given fairly rich backgrounds and all of the characters show, and stay consistent to, their true colors in both action and word throughout the story. We are quickly drawn in to caring about the characters which makes the story more compelling overall. Spencer's attention to his main characters does not stop him from provided PLENTY of victims throughout the book. Once the blood starts flowing, it doesn't stop. Alan Spencer creates amazing visual imagery in his story that will have your imagination in overdrive. Even as an avid horror reader, I found myself having to put my reader down multiple times throughout the book just to allow myself to fully process a scene that had just occurred. If the picture was any clearer, it would have to be on a television screen! Gore is provided in ample amounts to satisfy any horror fan without sacrificing the story. While I have not read any of Spencer's other books (yet) to provide a basis of comparison, I would say that B Movie Reels proves him to be a master of the pen (or word processing program) worthy of a look by any horror fan. Aside from some minor and infrequent typographical errors, I can find little to complain about in this book. I can definitely say that his other works, B Movie Reels being his sixth novel, have gone right to the top of my reading list. If you have yet to read anything by Alan Spencer, this is a great start! Overall – 4.85/5 – READ THIS BOOK NOW!!! !